This cosy characterful cottage is the perfect home from home for a family of four. Little Penn is just a ten minute walk from the beautiful Crooklets beach, perfect for paddling, beach games and sandcastle building. Kids will love splashing about at Bude Sea Pool, which can be accessed via the coastal path in the other direction, along with Summerleaze beach. Return to Little Penn for an evening meal in the spacious enclosed garden or snuggle up by the woodburner with a book. The property also benefits from an additional family room, with TV and comfy corner sofa. Escape to a rural retreat, nestled in a sleepy village in West Cornwall. Folnamodrysleeps 4 plus one dog, and has a spacious garden, surrounded by idyllic countryside, which is perfect for energetic children and curious wagging tails. Kids will love exploring the countryside, the nearby Trengwainton Gardens and the beautiful beaches which are just a short drive or bus ride away. The property is located just five minutes from Penzance, where you can find a great selection of shops, pubs, restaurants and a cinema. Return to the farmhouse style kitchen and cook up a family feast before curling up by the woodburner for a relaxing evening. 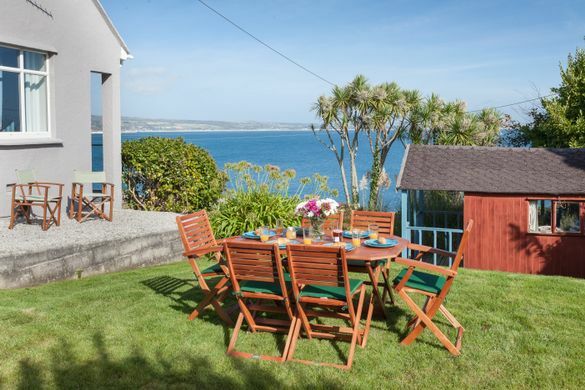 Blue Waters is a fantastic family retreat in the beautiful fishing village of Newlyn. The stylish sitting room offers the perfect spot to unwind with a glass of wine, whilst the games room offers a comfy spot for children to relax with some TV, board games and books, or have a go at table tennis or on the Nintendo Wii. There’s a lovely little garden for al fresco dining and wonderful sea views from the spacious sitting room. This seaside retreat sleeps 4 and has storage for surf boards and bikes for your Cornish adventures. Porthole Cottage is tucked away in a quiet spot, just moments from Mevagissey Harbour and a five minute drive from Pentewan, a family-friendly beach which is perfect for kayaking, paddle boarding and rock pooling. In Mevagissey itself, there’s plenty to do including crabbing off the harbour wall, beautiful boat trips and lovely cafes and restaurants. The property is ideal for a family of four, with spacious living areas, a gorgeous double bedroom and a lovely twin room. For a fun-filled family holiday in the Cornish countryside, The Cowshed in Helston is your ideal base. Sleeping four, this gorgeous rural retreat is surrounded by unspoilt countryside and woodland, just a short drive from Helston and the seaside town of Porthleven. Enjoy the evening sun and idyllic views from the conservatory or gather around the woodburner for a relaxing evening together. Kids will love saying hello to the horses in the paddock next to the property every day and exploring the surrounding fields and nearby coastline. For a larger family, Snug Barn provides a fabulous rural retreat, within easy reach of both coasts. This gorgeous dog-friendly barn conversion is set within a smallholding with farm animals for all the family to say hello to. The spacious barn has lovely views of the rolling countryside, with stunning vaulted ceilings, contemporary bedrooms and a cosy sitting room with a woodburner. There’s plenty of space inside and outside of the property for kids to burn off steam, and Mevagissey on the south coast, and Newquay on the north coast are both just a short drive away. Whisk the whole family away for a relaxing coastal retreat. Rosemary is situated in an enviable position, within walking distance of the golden sandy beach of Praa Sands. Sleeping 6 and with lovely outdoor areas, this seaside escape is perfect for surfers, large families and coastal walkers, plus it’s dog-friendly too. Cook up a storm in the kitchen whilst the little ones play at the mini children’s table, or enjoy dinner al fresco, listening to the sounds of the ocean. This property benefits from two parking spaces and cycle storage. If you fancy a Cornish getaway with the extended family, Resoon, which sleeps 8, is perfect. Children have their own little snug area to relax in, with bean bags, TV, Xbox and games. This relaxing family holiday home has panoramic views across Mount’s Bay and is within walking distance from both Mousehole and Newlyn harbours. The property has a large garden which is great for children and four legged friends (two dogs welcome) and inside there’s loads of space for everyone to kick back and relax.